Captions: Opposition Leader Don Polye shaking hands with Gloucester Health centre’s TB program officer Aloisia Tali whilst her colleagues wait for their turn at Gloucester station in West New Britainon Friday. OPPOSITION Leader Don Polye has described the government’s Free Health Care (O’Neillcare) policy as failed and grandstanding. Mr Polye said this following his visit to Gloucester Health Centre last Friday. He said the centre’s single ward was unfit for occupation by patients. 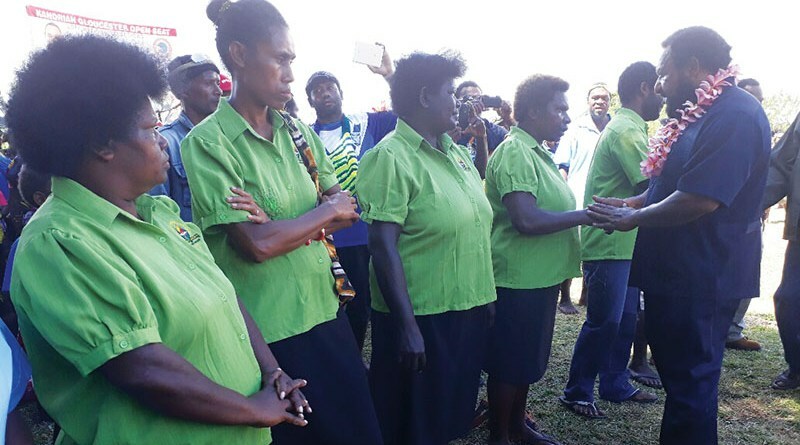 “By all health and hygiene standards, the ward should be condemned for occupation,” Mr Polye said. The government, he said, owes an apology to our people for misleading the citizens that everything was normal. Mr Polye said Mr O’Neill and his Health Minister Michael Malabag should hang their heads in shame. He was taken by hospital’s staff and management on a tour to inspect the condition of the facilities. A health extension officer, who did not want to be named, said medicine supplies were delayed by a month or two. He admitted that patients were paying for small portion of medicines they had. They presented Mr Polye a letter requesting funds for its rehabilitation. “I will not make a commitment on the funds sought as we do not have funds for such in the Opposition,” Mr Polye said. According to him, his Triumph Heritage Empowerment (THE) party led government would build four regional referral hospitals in the country coupled with sufficient operational funds and drugs. These hospitals, he said, will also cater for cancer and children patients. He said better still, he would look into converting some of the existing facilities into children, cancer and women hospitals in each region. He said his government would upgrade the Cancer Unit at Lae’s Angau Memorial Hospital and other similar, existing facilities in the country. Mr Polye said all the run-down health facilities would be rehabilitated during his 100 days in office. “Our THE party wants all the districts to have a hospital each. Also alll the LLGs to have a sub-health centre each whilst all wards to have a clinic or an aid post each. We will ensure they have specialist doctors, HEOs and nurses to serve our people better unlike we see today,” he said.